The day started off just like any other day, we were preparing to setoff on our Sea Glass adventure. We were still living inSequim at the time. I remember my husbandsaying he would like to take his car instead of my car and I was in ahurry and agreed. His car had been having problems startingoccasionally so I was a bit hesitant. The day was really gray and rainy when we first arrived on the beachand pretty windy but we decided we had drove all the way from Sequim sogoing back was not an option. We were worried about thetides coming in so we hurried up packed up our backpacks and headedtowards Glass Beach. We had a fabulous day andfound some really amazing Sea Glass and three marbles. While at the Point a lady approached us and asked if we had found anymarbles? She told us that she hadcome all the way from Eastern Washington to look for marbles. 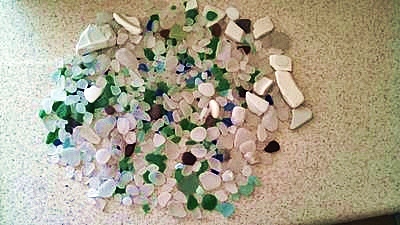 She seemed really intent in find marbles specifically and other typesof sea glass were not going to be enough. She looked almostanxious about not finding marbles that day. I told her if I found any I would let her know and I walked away tostart my hunt. The day passed so quickly (like it always does when you are seaglassing) we lost track of the lady that was looking formarbles. We could not figure out if she had passed us or when back to theparking lot. We headed back to theparking lot only to find we had left our car lights on all day. it was just a matter of having someone helpus charge out battery. So here is where the story becomes really memorable for all ofus. We were in the parking lot and of course three really nice couplestried to help out and charge our battery. The interesting thing isthat nothing worked the car was just not starting. We were getting a bit worried since it was starting to get dark andthere was only one car left in the parking lot. We decided to sit and be calm for a moment and eat a sandwich and letthings just be for a few moments. I looked up and there wasa woman coming towards the parking lot. It was the same lady that waslooking for the marbles earlier. We approached her and she of course agreed to help us. My husband connected the cables and thought ran across my head, I hadfound three marbles that day and she had foundnone. 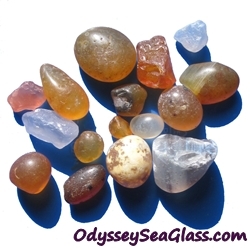 Quickly I searched my seaglass container and found two marbles so I approached her withboth. As soon as she had the marbles in her hand our car startedinstantly. I decided to ask her why it was so imperative for her to find marblesthat day. 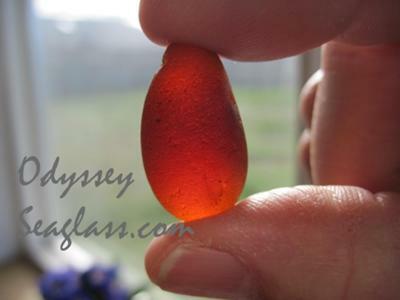 She shared with us that her father had recently passed and they alwayshunted for sea glass marbles on her birthday. That day was indeed her birthday so taking home some marbles back toEastern Washington from Glass Beach in Port Townsend was reallyimportant to her. She said she always felt close to her dad who had passed recently everytime she found marbles. As she was leaving she told us thatshe would cherish the marbles and they would always bring back pleasantmemories of that day every time she looks at them. I still get goosebumps when ever I think about that day. ~ submitted by Adie,owner of - BetterProperties Port Townsend. Your story made me tear up for some reason. What an amazing memory to have. Your generosity was surely rewarded 10 fold. Wow! That's a chilling story! Great story and hope you find many many more! I have not been able to get to that beach recently and don't know what it is like now?